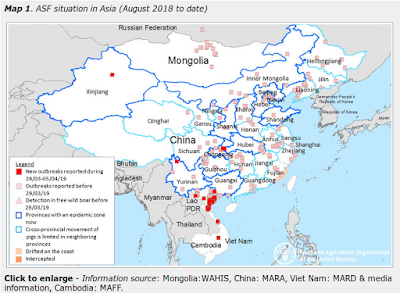 To give you an idea of how rapidly things change in the world of emerging infectious diseases, two summers ago (June 2012), no one had ever heard of the MERS coronavirus, the H7N9 avian flu virus was still 8 months away from breaking out in China, and avian H5N8, H10N8, H6N1 and H5N6 weren’t on anyone’s radar screen. Aside from the perennial concerns over change in transmissibility of H5N1 virus, our primary emerging disease concerns that summer lay in a major outbreak of West Nile Virus (see DVBID: 2012 Record Number Of West Nile Fatalities), and an outbreak of human infection with variant influenza contracted from show pigs displayed at county and state fairs. The CDC describes Swine Variant viruses in their Key Facts FAQ. When an influenza virus that normally circulates in swine (but not people) is detected in a person, it is called a “variant influenza virus.” For example, if a swine origin influenza A H3N2 virus is detected in a person, that virus will be called an “H3N2 variant” virus or “H3N2v” virus. Although the actual number of human variant flu infections that occur each year is unknown, the CDC has reported 1 or 2 cases each year since 2005. In 2010, that number jumped to 8, and in 2011, to 12. During the summer of 2012 more than 300 cases were recorded across the United States, and nearly all were linked to contract with pigs displayed at county and state fairs that summer. Last year we only saw a handful of cases, but with state and county fair season once again upon us (it runs June-November around the nation) the potential exists for seeing cases again this summer and fall. While fairs have instituted inspections for any signs of illness in livestock – as we’ve discussed previously (see Asymptomatic Pigs: Revisited) - pigs can carry this virus without showing any outward signs of infection. Swine are highly susceptible to a variety of flu viruses (human, swine, avian) - and can serve as `mixing vessels’, allowing viruses to reassort into new hybrid strains, a topic well covered by Helen Branswell a few years ago in a SciAm article called called Flu Factories. Some of my earlier blogs on swine variant influenza include: H3N2v: When Pigs Flu , You Say You Want An Evolution? & The (Swine) Influenza Reassortment Puzzle. These swine variant strains are – like the 2009 H1N1 pandemic virus – reassortants, that continue to circulate (and evolve) in swine herds. Starting in 2011, the H1N1v virus was found to have acquired the M (matrix) gene from the 2009 H1N1 pandemic virus. Since then, this M gene has been showing up regularly in all three swine variant viruses (H1N1v, H1N2v, H3N2v). The concern with these variant swine flu infections, as it is with any animal flu that jumps to humans, is that it gives the virus another opportunity to better adapt to human physiology. While humans have a long history of exposure to seasonal H3N2 flu viruses, research has shown only limited community immunity to these variant strains (see CIDRAP: Children & Middle-Aged Most Susceptible To H3N2v). The good news is that while some limited community transmission of these variant flu strains appears to have occurred during the summer of 2101, sustained and efficient human-to-human transmission did not, and for the most part, the virus only caused mild to moderate illness. But as we’ve seen so often in the past, things can change quickly in the world of infectious diseases. So while Chikungunya, West Nile Virus and MERS will be getting the bulk of the headlines this summer, public health officials will also be on the lookout for any new swine variant infections - and more importantly - for any signs that the behavior of the virus has changed. Exhibitors of swine, and those in charge of the venue, will want to consult Guidance Associated with Fairs.